At last, Camp Dark Snow 2014 has a date (17 June) and a location; 42 nautical miles east of Kangerlussuaq on the southwestern Greenland ice sheet, at an elevation 1250 m above sea level. Here each summer the ice melts down 1.48 m on average since 2008, only 0.3 m in 2009; and 2.1 m in the record melt year of 2012 (data after Fausto et al. 2012). This location is host to the PROMICE.org @Promice_GL “KAN_M” climate station. When we start the camp, there will be some residual winter snow on ice, how much, hard to predict, though we can see below that southwest Greenland has had this year 30-50% of normal precipitation. If this drought keeps up, we’ll see an earlier than normal bare ice emergence and higher than normal melt. precipitation difference from normal according to an observationally constrained atmospheric circulation model. Brown isolines indicate less than average precipitation. The contour interval is 10, 30, 50, 70, 100, 110, 120, 150 percent. Late June when we should put in our camp, there will be snow and slush in some areas until the snow is gone. Ideally, we have both snow and bare ice when we set the camp. The Digital Globe image below depicts what the surface would look like by say mid July once the snow cover is gone. 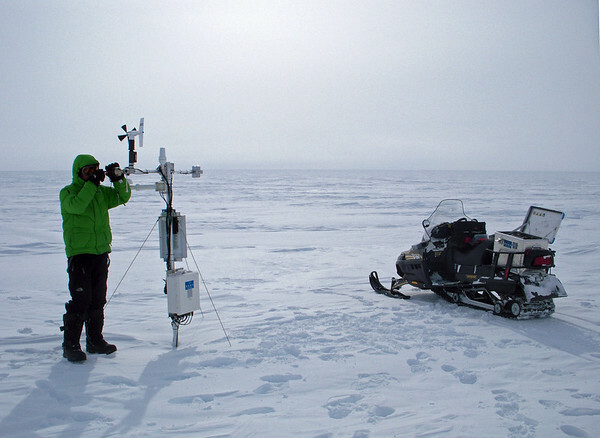 Our field experiments, to be elaborated further in future posts, include documenting the importance of dust, black carbon, and microbes in snow and ice melt. It is by pooling resources among these groups that we can do more/better science and get the science message out. Fausto R. S., D. Van As and PROMICE Project Team (2012), Ablation observations for 2008-2011 from the Programme for Monitoring of the Greenland Ice Sheet (PROMICE). In Bennike O, Garde AA and Watt WS eds. Review of survey activities 2011. GEUS, Copenhagen, 25-28 (Geological Survey of Denmark and Greenland Bulletin 26).